HONG KONG—They came in the hundreds in their lime-green T-shirts. Lining up on the sidewalks, they made threatening gestures and hurled raucous abuse at a 1,200-strong parade marching along a thoroughfare in Hong Kong’s central business district on April 23. Members of the Hong Kong Youth Care Association and other communist front organizations, as well as pro-Beijing provincial clan associations, have in recent years been commonly sighted protesting local pro-democracy groups or events held by practitioners of Falun Gong, a traditional Chinese spiritual discipline that is being suppressed on the mainland. The pro-Chinese regime groups’ recent provocations at the parade held by Falun Gong practitioners on April 23 cost a small fortune; The Epoch Times learned that protesters received over $1 million dollars in total from Chinese provincial authorities. These provocations are also representative of the overseas portion of a brutal persecution campaign that was launched on the mainland 18 years ago by former Communist Party leader Jiang Zemin. Jiang felt threatened by the popularity of Falun Gong, also called Falun Dafa, which was being practiced by 70 million to 100 million Chinese at its peak, according to state and practitioners’ estimates. Jiang vowed to “eliminate” Falun Gong and spearheaded the creation of an extralegal apparatus, the 610 Office, for the express purpose of targeting Falun Gong. On July 20, 1999, the persecution began with arrests countrywide. In China, hundreds of thousands of practitioners are being held in some form of detention, where they are met with brainwashing sessions and torture in a bid to make them give up their faith. Detained practitioners are also at risk of being killed to supply the Chinese regime’s booming organ trade, according to researchers of forced organ harvesting in China. Outside China, the Chinese regime rallies pro-Beijing groups to harass Falun Gong practitioners and interfere with their public efforts to raise awareness about the ongoing persecution. On April 23, about 1,200 Falun Gong practitioners from Hong Kong, Taiwan, and other neighboring Asian countries gathered in Hong Kong’s Edinburgh Place, a public square near Victoria Harbor, to perform slow-motion exercises and hold a rally to denounce the persecution. Later, the practitioners carried banners that called attention to the persecution as they marched through Central District to the Chinese Liaison Office. The events were held to commemorate the peaceful appeal of 10,000 Falun Gong practitioners in Beijing on April 25, 1999. Hundreds from various Hong Kong pro-Chinese regime groups were at hand to protest the Falun Gong activities. 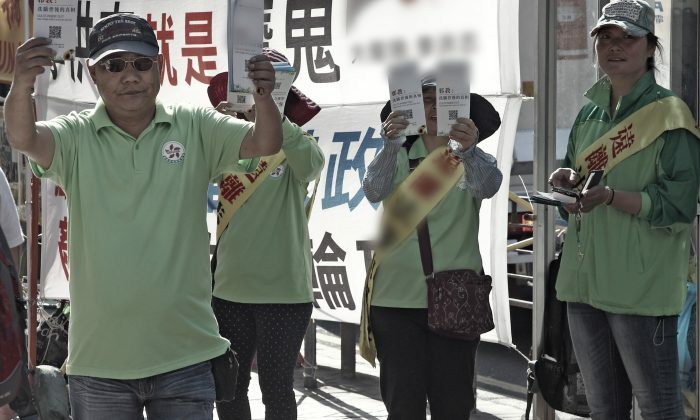 Most prominent were members of the Youth Care Association in their lime-green shirts, loudly heckling the participants and holding placards with anti-Falun Gong slogans. About 50 Youth Care Association members donned red shirts and beat out cacophonous communist “red” tunes on military band instruments. The Youth Care Association was founded in 2012 and is widely believed to be a front organization for the 610 Office. The association has its headquarters in the same building as the Shenzhen branch of the 610 Office, according to Hong Kong newspaper Apple Daily. Mr. Lam noted that the pro-Chinese regime groups’ harassment of Falun Gong on April 23 was the largest in scale to date. He learned from a high-ranking official from the public security bureau in Shenzhen, the Chinese city neighboring Hong Kong, that the Chinese regime spent over HK$10 million (about $1.28 million) to finance this single protest operation. Mr. Lam said that the protest money was drawn from the “social stability maintenance” funds of Chinese provinces near Hong Kong, such as Guangdong and Fujian, and handed to the participating clan associations in Hong Kong or mainland Chinese protesters. The Chinese regime spends tens of billions each year on “social stability maintenance,” or domestic security enforcement, which includes the suppression of human rights activists and spiritual groups like Falun Gong. The Chinese Ministry of Finance places the 2016 expenditure at 166.8 billion yuan (about $26 billion), although analysts say that the actual figure, including spending on extralegal detention facilities or on hired thugs, could be much higher. Mr. Lam said that each of the protesters were paid between HK$500 to HK$600 (about $64 to $77) for their attendance. The heads of the different groups received substantially higher payouts, he said. For example, the leader of a local Fujian clan association received HK$2 million (about $260,000) from the Fujian public security authorities. The clan leader had already made a small fortune from organizing anti-Falun Gong activities in Hong Kong, according to Mr. Lam. But the Chinese regime’s dollars don’t easily buy support in Hong Kong these days, Mr. Lam said. Many locals now have a good understanding of Falun Gong and don’t wish to join the regime’s persecution effort. Several members of the participating Fujian clan association also opted out of harassing Falun Gong on April 23.